An Easy Berry Mojito that’s made with fresh ingredients and La Croix sparkling water. La Croix Cocktails are the perfect summer drink of choice because they’re low in both sugar and carbs. When it’s hot outside, the last thing you want is a sugar-filled drink. Swapping in sparkling water gives you that bubbly effervescent drink but without all the sugar. With La Croix, there are several flavor options – so the drink possibilities are endless! Who loves a good mojito?? My only beef with a traditional mojito is that they’re just too sweet for me. I’m not a fan sweet alcoholic drinks these days, especially not in the heat of summer. I wanted this berry mojito to be low in sugar, fresh, and super easy to whip up. 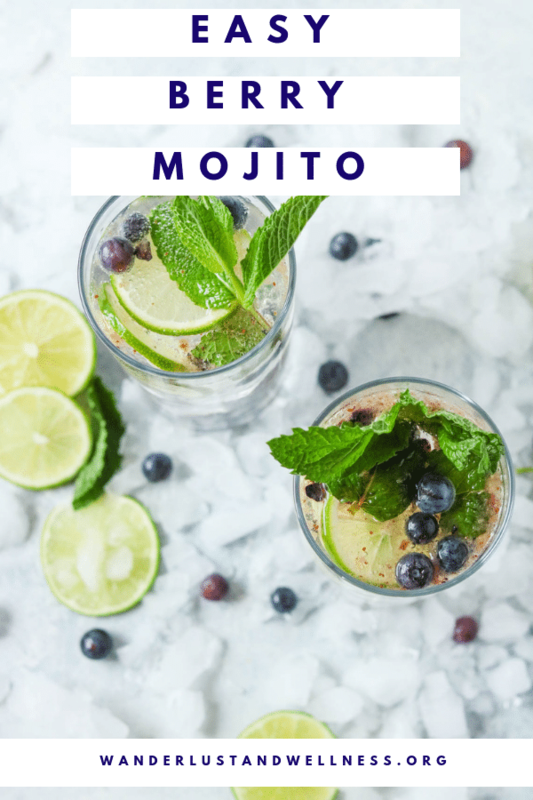 I’m confident I achieved all three with this easy berry mojito recipe. Does La Croix have alcohol? No, La Croix itself does not contain alcohol it’s simply sparkling water. In this recipe, you’ll add in white rum. If you’d like a non-alcohol option, you can omit the rum. How do I muddle the mint and blueberries? With any drink that contains fresh fruit or herbs, you’ll most likely need to “muddle” them. Of course, you could use the back of a long spoon, but I find using an actual cocktail muddler makes the process much easier. Can I swap out La Croix for tonic water? No, I would not suggest doing so in this drink. La Croix is sparkling water – which is plain water that has been carbonated and then infused with various flavors. Tonic water has a very distinct flavor of its own due to the addition of quinine. Is La Croix low-carb and low-sugar? Yes, La Croix contains zero carbs and sugars making it a great effervescent choice for a bubbly low-sugar and low-carb cocktail. Add the blueberries and mint leaves to the bottom of two high ball glasses. Using a cocktail muddler, muddle the berries and mint leaves. Next, add 1.5 oz. of rum to each glass. Then add the lime slices, ice, and fill to the top with La Croix lime flavored sparkling water. Garnish with additional mint leaves and fresh berries and serve. Note: If it’s not sweet enough for you, you can always add in a few drops of stevia or even make a simple syrup and add a little of that in. 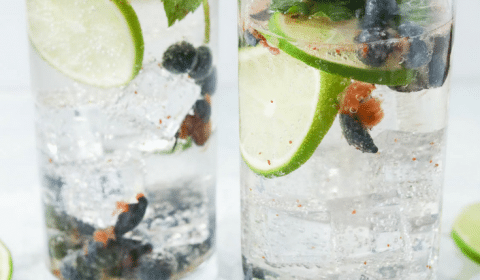 Enjoy these other sparkling water cocktails! This easy berry mojito is also low in sugar, making it the perfect summer drink! Next, add 1.5 oz. of rum to each glass. Then add the lime slices, ice, and fill to the top with La Croix sparkling water. Garnish with additional mint leaves and fresh berries, then serve. If you prefer a sweeter cocktail, add in a few drops of stevia. This drink looks so refreshing! Using the fresh berries make it perfect for summer too. We loved it, as it wasn’t too sweet. Although I added a splash of mint simple syrup but only a tiny amount. Just perfect for summer days by the pool. Mojitos are great for spring and summer! I like that this one has some blueberries muddled with the blueberries. I think I’d freeze the blueberries for the garnish. 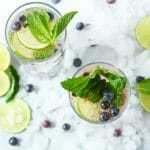 Mojitos are my favorite cocktail and I will definitely try your summery version with fresh blueberries and mint! It looks perfect for a lazy day in the garden! These look so refreshing and delicious! Especially with this hot weather right now. So yummy! Just what I need on a Friday! I like the addition of berries for a pop of color and brightness to the drink. Must make! I love that it’s not too sweet and absolutely refreshing! The berries add a nice touch of color and great flavor. This berry mojito is just what I need RIGHT now! 😀 The addition of the berries is lovely. Looks SO refreshing. We always have weekend parties at my place. This one is sure on the list for this week. I can’t wait to make it for friends and family ! !